Many taxi service providers are looking to promote their business through a mobile app even as Uber is conquering new countries and regions. High demand within regional markets is motivating owners of taxi businesses to look for companies that promise quick development-to-market, and as a result they often end up with software development agencies that sell out-of-the-box solutions or so-called white label apps. What’s the difference between a white label software product and one that’s built from scratch just for your company? Is it true that you and your end users can get the same level of service if you purchase a white label mobile app? The term white label originated when new vinyl records were given out in white sleeves to DJs before they were released to the public. A white label product in the modern meaning of the word is a product that’s developed by a company, rebranded, and then sold to another company. In the digital world, white label often refers to a software application that’s customized according to the branding of the reseller. For example, a company develops white label food delivery app and sells it local restaurants that then use it as their software. 1) By reusing the backend codebase but changing the frontend of the app, resulting in a different appearance to match the reseller’s branding. 2) By creating a multi-tenant application; in this case, the app instance will be the same but each tenant can have an app with a slightly different set of features. This model is commonly used for software-as-a-service, but it’s more complex to build and maintain. 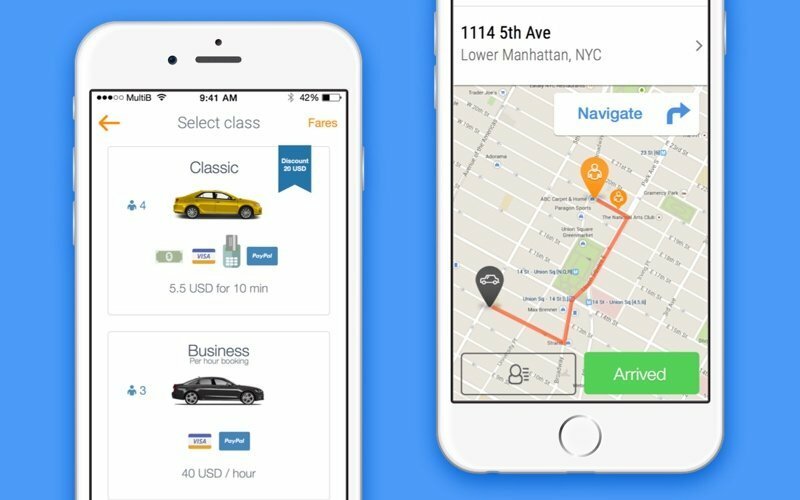 What are the most common features of white label taxi apps? What’s the most common business model for white label taxi apps? In the majority of cases, developers of SaaS products rent them out using a subscription model. This subscription usually consists of two fees: a setup fee and a monthly payment, the latter dependent on the number of drivers that are registered with the app. For example, TaxiStartup, one of the most promoted providers of white label taxi apps, charges a one-time development fee plus a monthly maintenance fee of $99. Companies that work with TaxiStartup white label apps can choose whether they want to pay based on the number of drivers or number of trips. 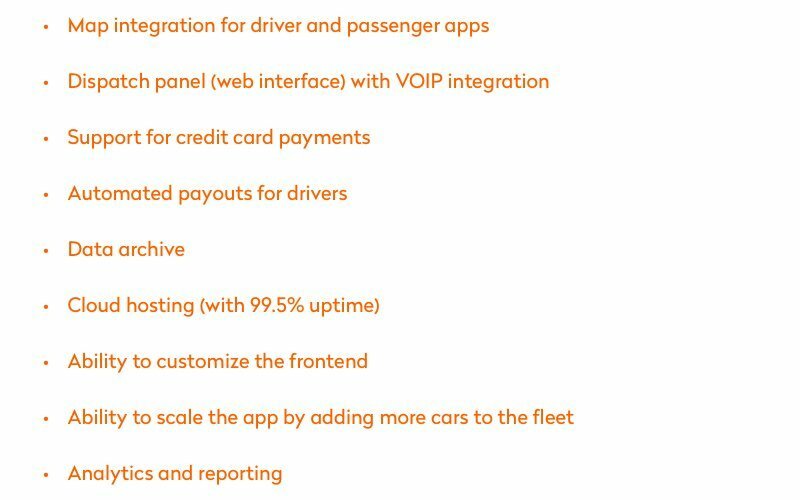 Taximobility, another white label app provider, offers various packages (from $18 to $22 a month per driver) depending on the size of the fleet. For fleets up to one hundred drivers, there’s also a setup fee of $1000; companies that work with more than one hundred drivers get the setup for free. Elluminati, a large white label on-demand app provider, also has flexible pricing depending on the size of the fleet. Does Yalantis also develop and design white label taxi apps? As a software development company, Yalantis sometimes receives questions from our clients about whether we work with the white label model. The answer is no – Yalantis only provides our clients with 100% unique, built-from-scratch apps. A lot of people have wanted to know why we don’t adopt a software-as-a-service business model, so we decided to comment on the most significant advantages and disadvantages of the white label model to explain our position. We’ll start with what makes white label so attractive. From the business perspective, there are three major advantages white label apps have over custom-built ones: shorter time to market, significantly lower cost, and no need to maintain the app after it’s released. What are the advantages of white label apps? Imagine that you have a regional taxi business with a fleet of cars. The competition is quite harsh, but nobody in the market is currently using mobile apps. You decide that your drivers will seriously benefit from adopting an on-demand taxi business model. Contacting an app development company and working with them – from planning and designing the user interface through branding, development, and testing – will mean that you have to wait for at least a couple months before launching your app. This potentially means losing your competitive advantage on the market. Developing a product from scratch is never cheap. You need to hire a business analyst who will help you figure out a set of core features for your app and find a designer who understands your product positioning. And this often requires working with investors. For a lot of companies, signing up for a white label solution is seen as a way to get to market fast and without too much upfront investment. White label apps are also easily customizable so you can get your own branding and design. Companies that provide white label apps (this model is also known as software-as-a-service) promise to take care of support and maintenance after they’re released. Picking a server, supporting the application after it’s deployed, updating code, and making sure everything runs smoothly will require a DevOps or system administrator on the payroll, and for a lot of business owners this is too burdensome; they would much rather have all maintenance taken care of by professionals. What are the most serious disadvantages of white label taxi apps? When you purchase a white label app, you’re getting a piece of software without knowing what’s going on behind the scenes. The agreement you sign with a white label app provider doesn’t give you access to their backend, so you can’t evaluate code quality. You have to trust what the white label provider tells you about the quality of their service and rely on the maintenance and testing that they provide without knowing how thorough it is. White label apps tend to include a set of core features that can be somewhat customized in terms of labelling and color schemes. At the same time, SaaS products often have a very basic set of features that are optimal for an average app of their type. White label apps won’t do if you require complex business logic, which means that you need to understand if a white label app is going to satisfy your business needs in full or if you should be looking for a company that can develop your app from scratch to meet your specific needs. When you use SaaS products you’re essentially renting out an app for a set fee – it’s a subscription. White label services are often cloud-based for convenience, but this might mean that you have to transfer your users’ data to the cloud and essentially give up control of it. Very often, white label providers claim 95.5% to 99% server uptime as part of the agreement, but there’s truly no way to predict in advance whether their servers will be as reliable as they promise. You need to find out if a white label provider lets you export data and make sure your agreement protects you from a situation where the server is down and you can’t access your app. Scalability of your app is something that needs to be thought about at the very beginning of planning and development. When you’re building a taxi app from scratch, you need to guarantee that it will still run smoothly even if there are a couple thousand drivers and a million riders who use it daily. When it comes to white label apps, you have to trust the provider when they say that their architecture allows you to hire as many drivers as you want, but you can never know for sure. App Store review guidelines changed in 2017 with the aim of cleansing the App Store of spam and app clones. This means that some white label providers might end up with their apps deleted from the App Store if they’re found not to be trustworthy or seem to be using parts of functionality that have already been developed for a different app. How can you make sure your software service provider is reliable and trustworthy? Here’s a list of questions you can ask a software development company before signing a contract for a taxi app. These questions are relevant both for white label and custom-built apps. Answers to these questions will help you minimize risks. These questions cover two big issues: maintenance and data recovery and security and updates. 1. How easy is it to import and export data to and from your server or database? 2. Do you guarantee data backups, and if so how are they done? 3. Do you provide free disaster recovery support in the event of a hardware failure? Do you meet critical security and compliance requirements for the transportation industry? How do you perform testing and how often does it take place? How often do you update the app? What do these updates include? White label might seem like a universal solution that can save you money and still give you an app that can secure your place even in highly competitive regional markets, but it also entails serious risks in terms of reliability and scalability of the software you’re getting. If you’re looking to build a taxi app that’s reliable and easily recognized, you might be better off getting a quote for development from scratch. What Technology Do You Need to Build a Taxi Booking App? Have some thoughts on how to change taxis in your city? We can take you from here to where you want to be.